Comparatively few printings of Blake’s designs are known between his death in 1827 and the revival of interest in him by Gilchrist’s biography in 1863, and it may therefore be worth recording several new printings here. B. Hamilton. Gallery of British Artists, from the Days of Hogarth to the Present Time, or Series of 288 Engravings of their Most Approved Productions, Executed on Steel in the First Style of Outline, Selected, arranged, and accompanied with descriptive and explanatory Notices in English and French. In Four Volumes. Paris, 1837. A duplicate titlepage reads: Galerie des Artistes Anglais, depuis Hogarth jusqu’a nos jours ou suite de 288 gravures de leurs productions les plus estimées, soigneusement gravées au trait sur acier, Choisie, mise en ordre at accompagnée de Notes descriptives et explicatives an Anglais et en Francais. En quatres volumes. Paris, 1837. This is evidently just a re-issue of Hamilton’s English School (1830-32), misleadingly retitled, without advertisement or explanatory matter other than for the designs, with the same number of plates (288) and the same Blake plates and descriptions of “Death’s Door” “La Porte du Tombeau” (No. 181) and “Death of the Strong Wicked Man” “Mort d’un Réprouvé” (No. 271) and explanations as before, arranged in alphabetical order. Thirty Pictures by Deceased British Artists Engraved Expressly for the Art-Union of London by W. J. Linton. [London] 1860. 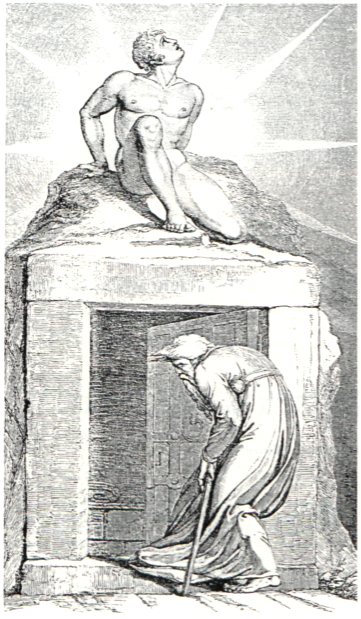 Plate X (12.1 × 20.8 cm) is “Death’s-door” after W. Blake. There is no accompanying text. The same plate, with the inscription altered, appeared in John Jackson [& William A. Chatto], A Treatise on Wood Engraving, Historical[e] and Practical (1861), as the frontispiece (in the Bodley copy) or “at p. 632” (according to the text, p. 591*), “inserted” “by the kindness of the Council” of the Art Union, in whose “Volume of 1859 [sic]” “It was [first] published”. (I am sorry to say that Blake Books  does not indicate that Jackson’s book had a Blake plate.) Linton went on to make “Facsimile” illustrations “from Blake’s Own Works” for Gilchrist’s “Pictor Ignotus” of 1863 and to write and illuminate Blake-like poems himself after he had settled in North America.